The New York Times says that 17 percent of clicks on pay-per-click advertisements are fraudulent. 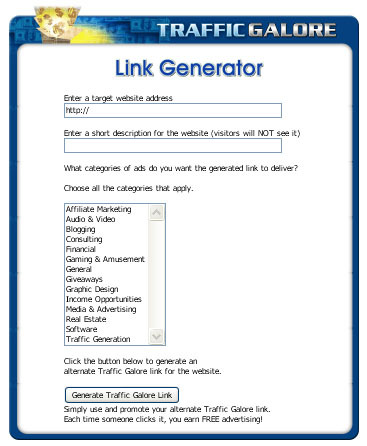 Traffic-Galore.com offers a way for business owners to get targeted traffic to their website without paying for expensive pay-for-click advertising. Kaira Simpson faced a challenge that affects many small business owners—how to get traffic online that is unique and will convert to sales. She found her solution in http://www.traffic-galore.com. What Simpson loved about the site is how easy it was to use. The program was created to save business owners time and money without spending tons of money on expensive and ineffective pay-per-click advertising. According to an article in the May 13, 2009 edition of the New York Times, about 17 percent of all clicks are fraudulent. That doesn’t include the clicks that are from people who really aren’t interested in the product. For Simpson, finding a way around pay-per-click advertising and getting traffic was the icing on the cake. About Traffic-Galore.com: Traffic-Galore.com is a program designed to drive traffic to websites without having to spend money on expensive pay-per-click advertising. 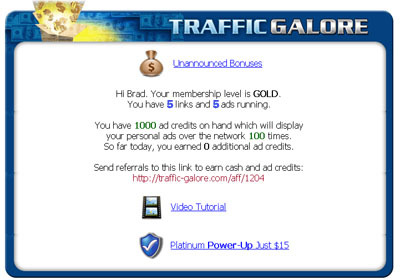 Learn more at http://www.traffic-galore.com. Traffic Galore is unlike any other traffic generator on the planet!Viral web site traffic, targeted web traffic, AND solo emailing ALL in 1! Catagorized Ad Placement SystemGetting targeted web traffic is easy with Traffic Galore's categorized ad placement system.